Filed under Who Is This? Hello my name is Joe Britton. I am writing to find out some information about my uncle’s racing career. His name is Bobby Waldon. He raced in the 50’s and 60’s. I think he got out of racing in 1970 or 71. I know he was involved with Carl Stone and his ‘32 Roadster. He built his first dragster in 1961. Ted Arnold was the driver. 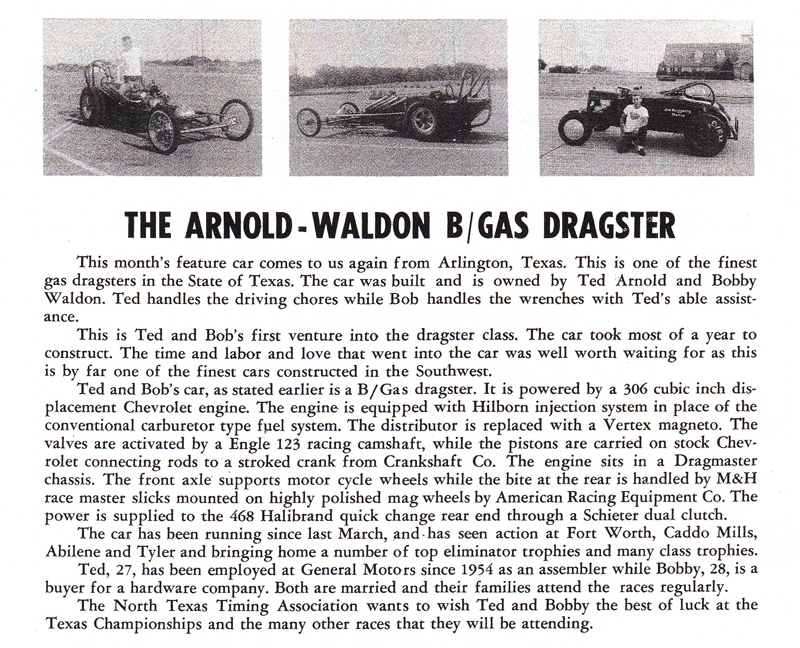 The car was Arnold and Waldon’s B/Gas Dragster. At one time it might have been Arnold , Nelson and Waldon. He and Ted also had a speed record of 9.72 @ 151m.p.h. He and Buck Cumby had an F/G 34 Ford. Ted Arnold was killed September 1 1963 at Green Valley. Can anyone confirm this, and whose car he was driving that day? I have attached a program for Sept. 9-10, 1961 at Caddo Mills, with a write up on them. They also were Texas State Champions. Anyone with more information, please post it here, it would be greatly appreciated. It was around 3pm ,,there was not enough fuel dragster so Vance Hunt had to run against a c gas dragster, So Ted in the right lane was goin to make a show of it, so he let the c gas draster get down the track than ted took off. when he got on the other end to let off the throttle it stuck, and ted arnold went over the hill threw the nets and over the guard rail and the through two trees growing at a V. and it pushed the motor into the driver area and killed him, the motor would not go threw the trees and I was there when Vance Hunt let the grease rag get in the butterfilies and he tried to jerk it out and it hung the throttle wide open. I just pulled Gene Lavy out of the front of the car. seconds later it took off to the bleacher area, close the finish line and hit a 48 anglia called Miscarriage ,,ted was sitting on top of rollbar and managed to get in the car and was thowned from the car, all it done was skin his bald head.. this all happened in the pit area. my name is jcaraway18@gmail.com, I got some tommy ivo stories if you want to hear them stories. Willis Ragsdale my dad would love to hear from yu, My dad is Dub Caraway. Could that have been Vance Hunt’s car? I recall being way too close to where there was an horrific car/tree argument at the top of the hill near the end of the shut-down around that time. I don’t recall any other Green Valley fatalities but, at my age that doesn’t mean much. Another thing I remember about that meet was Bennie “Two Motors” Osborn being scared to death. First time I’d ever seen that… but it obviously worked for him. His concern was centered around the giant propeller on the back end of Art Arfons’ Baloney Slicer in the Gas Eliminator final round. He solved the problem by staying well ahead of the slicer all the way to the end. Cant slice if you can’t catch.